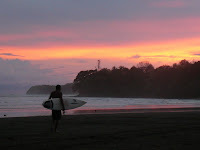 surfing at Playa Estero at sunset. Well it is time to move on, i have decided to Fly out to Belize From San Jose, Costa Rica ins tead of heading south again to Panama City to fly out. This saves time for Ian Who needs to head North any way, and also lets me explore a bit more of Costa Rica (the flights are cheaper also). I had a spectacular night, last night, surfing by myself at sunset, my choice of waves, left or right, no other surfer out, a sky on fire, off shore breeze, and a warm embracing sea, a sweet sweet way to leave Santa Catalina. I want more i want to stay there are more people to meet, and more challenging surf breaks i want to conquer. I tried surfing La Punta in Santa Catalina ( a reef point break) i got a three OK rides, though mostly ate it in a big green lip that proceeded to send me through a spin cycle. I never touched the reef however and getting back out through the waves on the inside wasn't too challenging, all and all a forgiving point break to get your fitness and steal honed on for bigger days or tougher breaks. however not just the surf is addictive, the sheer beauty and accessibility to remote wonders in this land calls you to stay. The Point on an average day. La Punta, Santa Catalina, Panama. I don't want to leave, i want to stay in panama, to buy a little house, become a fisherman or some other Romantic notion of a simple life profession. 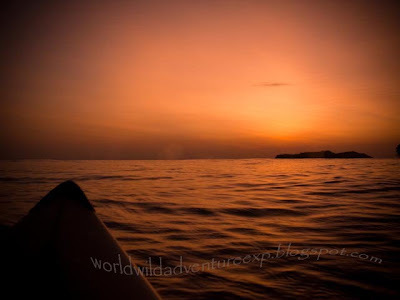 I desire to surf the waves and kayak the islands, climb the trees and journey the rivers of this wonderful land called Panama, it hits a chord some where deep in me, a primordial calling drawing me into its beauty and wildness, all my senses are excited yet also at ease. I must concede to the reality that I will have to thankfully return again to panama, and see more of what I have not seen and enjoy again some of what I have, this land has earned a spot in my soul and I hope it doesn't change to quickly that it loses the magic that has captured, despite the fact I have seen only a portion of what it has to offer. For those of you looking for the gaps in the story so far, I will post it all ASAP now that again I have easy access to the net. Thanks for your enjoyment J. Note: thanks to other surfers and tourists for the shots with no watermarks. Golden Sand, Blue Crystal waters, Turtles, Mantas, Monkeys and Sharks. this Is a Lost World of wonder Hardly explored and full of beauty. I feel privileged to have visited Isla Coiba. we spent nights under the star filled skies watching the waxing moon build to its climax over the nights. the crescendo was our final night paddling back to the cabins at the ranger station where the sunset the sky on fire, as well as the moon that simultaneously rose out of the east. it was large and red and framed by the silhouettes of the Islets covered in jungle, we lingered and watched it rise to its milky white heights and felt humbled to be in such a serene place. during the days we often walked into the shade of the Forest, where monkeys played and birds sang and the sun dappled green Leaves like glowing green jewels, hid the source of many a strange cry of beauty. however now and then little white faced monkey troops privileged us with lengthy sightings of there clan as they rummaged through the trees or along the coastal shores. Our kayaks where our transport and the rolling warm pacific seas our medium to travel upon. below us the depths called, you could see the fish swimming below and in the shallows the bright colours of the coral reefs beckoned for us to snorkel at every moment. tall trees reached high from the rocky shores to the sky promising cool shade from the hot sun, though the water won out more often than not. the waters where warm yet cooling and full of fish that danced and swirled and encompassed you if you chose to plunge into the depths. Giant pacific green turtles would rise from the reef to get a better look at us if we floated as still as could be, while Hawks billed turtles would swim around you close enough to be touched when you dove down to visit them. Coral Gardens stretched out in continuous or sporadic areas of action. above the water and on the sand hermit crabs are kings. They scamper all about and climb everything they can, searching for all that is edible and cleaning the areas of all things that may become foul. there extra terrestrial presence created a constant memory that the greatest fascinations and wonders that need to be protected are found right here on earth.